Egypt shut its border crossing with Gaza on Saturday for the first time since opening it on a routine basis last month, and angry Palestinians stormed the gates in protest, Hamas officials and witnesses said. 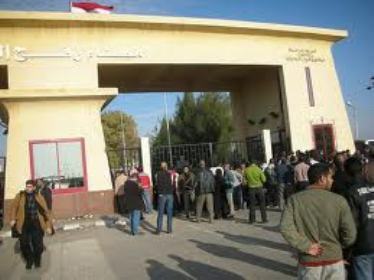 Palestinian border officials said three buses filled with 180 passengers had waited several hours to cross the border at Rafah, the Hamas Islamist-ruled territory’s gateway to Egypt, and some of those waiting responded by forcing the gate open. “We have not been notified of any reason for the closure, passengers are angry,” one of the officials told Reuters. Hamas police escorted the protesters back across the border a short time later, after Egyptian soldiers ordered them to leave. There were no reports of any violence or arrests. The incident came as Palestinians were said to be planning marches to the Israeli borders from neighbouring Arab countries to mark a June 5 anniversary of Israel’s capture of the West Bank and Gaza in a 1967 war. An Egyptian security source said the terminal at Rafah, Gaza’s only gateway not controlled by Israel, had been shut for maintenance and may reopen by Sunday. Officials in Gaza said they had not been notified beforehand. Egypt had reopened the crossing on a routine basis on May 28, a step that eased conditions for the coastal territory blockaded on its other borders by Israel, which says it needs to ensure Hamas doesn’t smuggle in weapons. But tensions over conditions at the Rafah terminal have been building since Hamas accused Egypt this week of placing limits on the number of people allowed through. Border officials of Hamas, the Islamist group that runs the Gaza Strip, said Egypt had set a maximum of 350 Gaza residents to be granted entry each day, though a senior Egyptian security official denied any quota had been imposed.